It’s quite evident from the name bitter gourd (karela), that not many people would be a fan of this vegetable. Apart from the health benefits, if made well, it can be transformed into amazing snacks. When they take the form of crispy fries, the humble bitter gourd can become a delicacy. The mild bitterness blends well with the spices and makes it a good tea time snack or side dish along with dals, sambhar and rasam. Wash the bitter gourd, discard the ends, and cut it into uniformly thin rounds. Then pat-dry the pieces using a cloth. I did not de-seed them, but you can choose to do so if you are using the longer bitter gourds. Once dry, take the cut bitter gourd pieces in a bowl and add all the spice powders and mix well. Add 1-2 tsp of oil so that all slices are coated with the spices. Alternatively, you can sprinkle some drops of water but you have to take care that the mixture doesn’t turn soggy. Heat oil in a pan on medium low flame. Since the size of my bitter gourd pieces was small, I just shallow fried them. Add the pieces one by one into the oil in batches. Flip the pieces so that the pieces fry evenly on both sides. Remove them from the flame when they turn crisp. Drain the excess oil using a paper towel. Serve them hot to munch, as snacks or during tea time. The older and bigger bitter gourds will have the more bitter seeds. I would recommend removing them. You can sprinkle some aamchur / chat masala on the chips once you take them out of oil while they are still very hot. My travel tales generally have a strong association with food. As a child, I used to travel to North India for vacations. I clearly remember yogurt was extensively used to make the gravy for side dishes that go along with rotis. Cauliflower is a vegetable that blends easily into any form and is generally liked by everyone. The yogurt gravy in this recipe adds a tangy flavour along with the kick of the spices. The florets soak in the spicy essence of the gravy and end up being a delight on the taste buds. Wash the cauliflower and cut them into small florets. Use the picture below as a size guide. Soak the florets in warm salted water for about 15 mins. After 15 mins, drain away the water to remove impurities. Lay the florets out on a kitchen towel so that excess water is absorbed. Heat oil in a pan and let it warm a bit. Then add mustard seeds. Once they splutter, add in the cumin seeds. Add the grated ginger and saute well. Now add in the cauliflower florets and turmeric powder and mix them well so that the yellow colour spreads evenly. Next, add the green peas, salt and 2 cups of water and cover with a lid after mixing well. Cook this stage on a low flame. 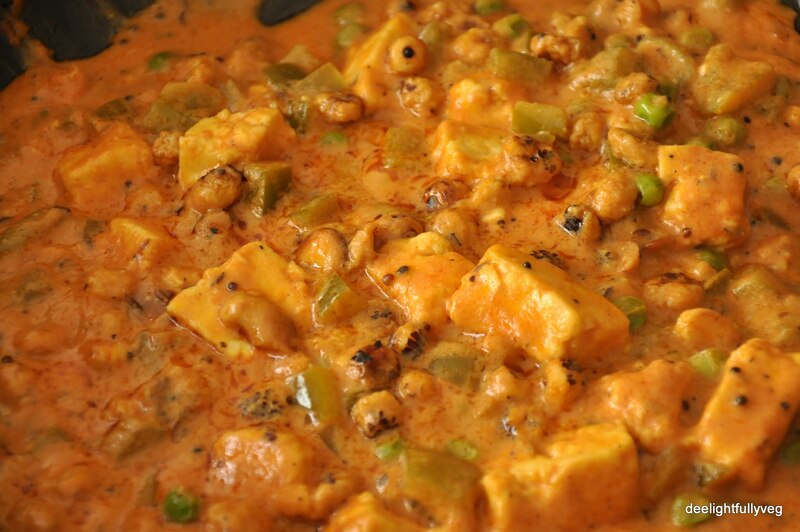 While this is cooking, take a bowl add the curd, a bit of salt and gram flour and mix well. I used Greek yogurt which is a bit thicker than homemade yogurt. Adjust the consistency of yogurt as you see fit. After the florets have cooked through, remove the lid and add in the yogurt mixture to the pan. Also add the garam masala powder. Finally, add the chopped tomatoes and mix well. Let this cook for another 5 mins. You need not cover the pan at this stage. Don’t overcook the cauliflower. You want them to retain their shape. Depending on the thickness of your yogurt, you may need to add some water to thin the gravy. We have all heard the saying ‘Health is wealth’. It essential to eat a balanced diet that includes all kind of vegetables. Bottle gourd is an underutilized vegetable – but it contains loads of nutritional value. 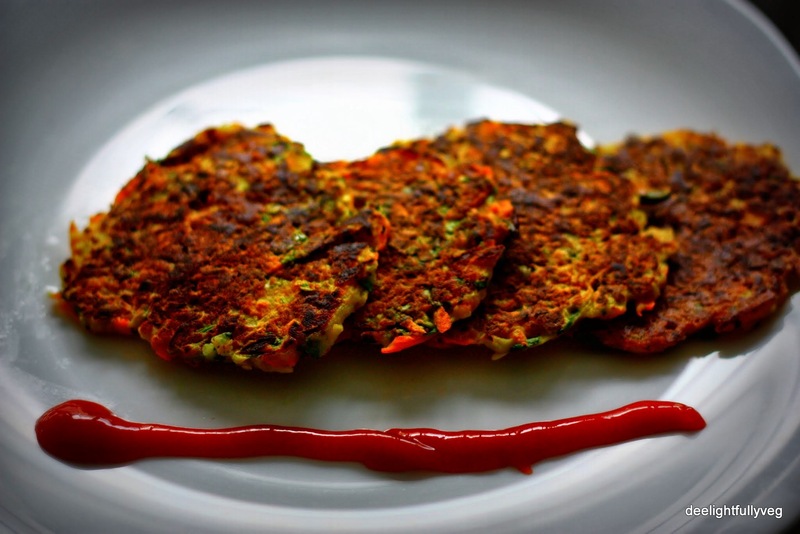 This side dish works very well in lunch boxes when paired with rotis. It can be cooked in no time provided you have soaked the dal earlier. Bottle gourd goes by many names in India – mainly Lauki/Doodhi/Lobia. This dish is essentially all that you would like in everyday cooking – almost no oil, healthy, quick to make and hassle free. Soak the chana dal in warm water for 30 mins and keep aside. 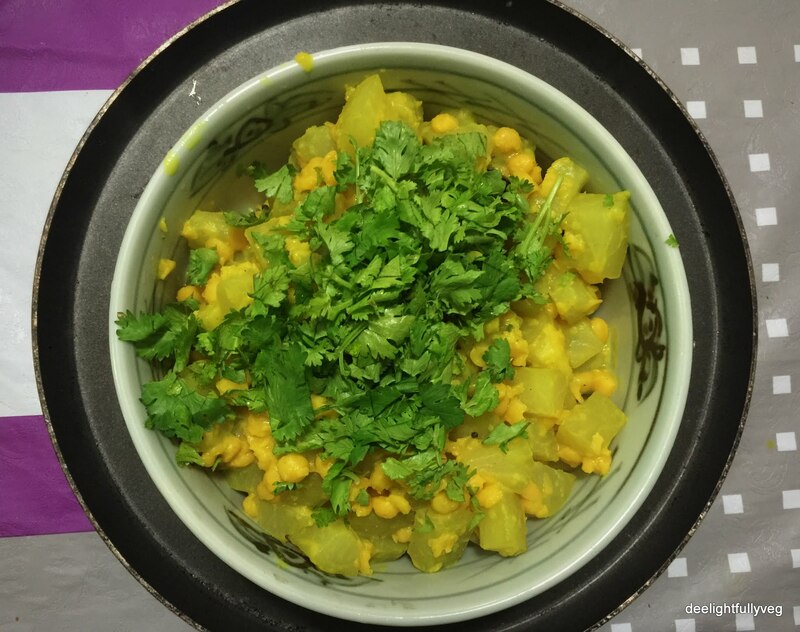 Cut the bottle gourd into cubes. Immerse them in water so that they do not lose colour. Drain the water from the chana dal. Take a pan and put the soaked chana dal in it. Add turmeric powder, salt, oil, green chillies, and the grated ginger. Add about 2 cups of water and mix well. Turn the flame on to medium-low and let mixture boil uncovered for at least 20 mins. After 20 mins, you will notice that the dal has nicely puffed up and it should not taste raw. It should break easily with a spoon. Now add the bottle gourd pieces along with some salt. Cook with the pan partly covered. Add the remaining 2 cups of water in stages depending on the consistency that you want. Also add the garam masala at this stage. Stir nicely. Finally give the tadka using mustard seeds, red chillies and asafoetida. Switch off the flame. Garnish the delicious sabzi with coriander leaves before serving. It is important to soak the daal for at least 30 minutes. On weekends, I like to make dishes that I usually don’t cook on routine-filled weekdays. 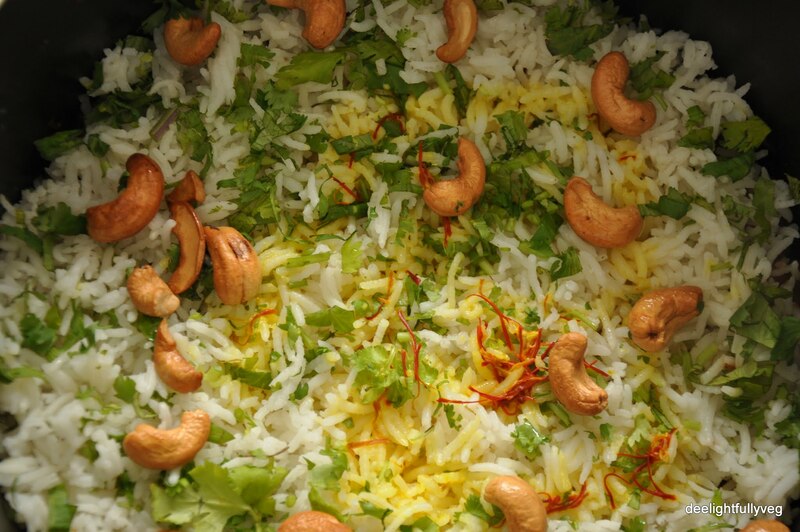 This weekend, my husband and I felt like eating ‘Vegetable Biryani’. We wanted to make it well-balanced and nicely flavoured – something that came close to what we had eaten at a restaurant. 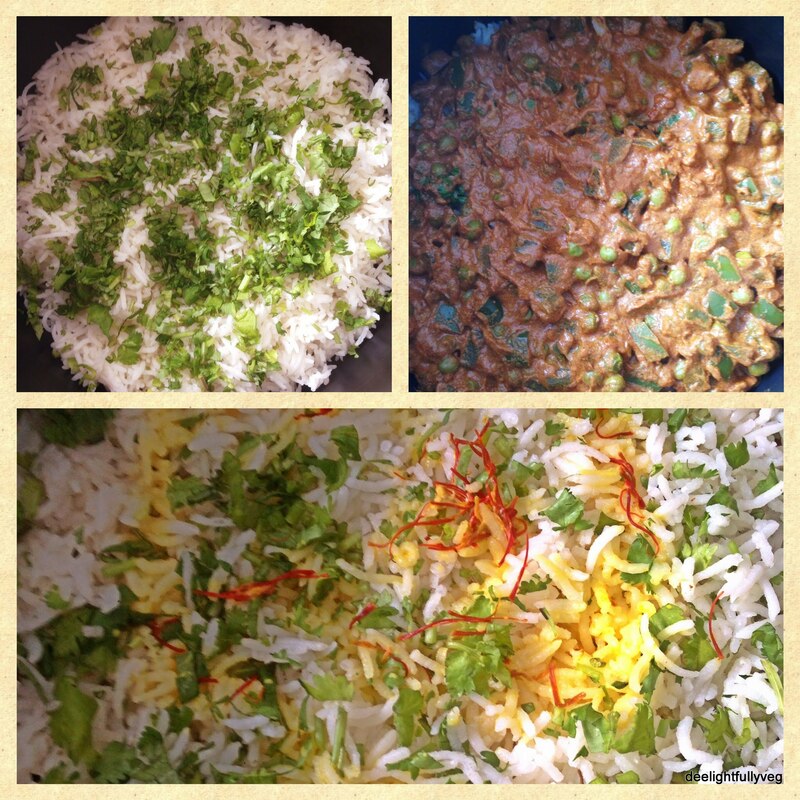 I had never made Biryani at home before as I generally end up making fried rice or pulao. I am glad I tried making Biryani since I loved the way it turned out. We gobbled up the entire dish in no time and had a satisfying weekend lunch. I dished up a fruit and vegetable salad along with this dish and those flavours went well with the rice (that recipe will be another post soon 🙂 ) Now, the trick with Biryani is to have a little patience while cooking and you will end up having great results. Multitasking the prep work will be advantageous as it will reduce the cooking time considerably. Soak the basmati rice in water for around 20 mins. Meanwhile, dry roast the ingredients mentioned for the biryani masala for 7-8 mins on a low flame. Once they are roasted, switch off the flame and let the pan cool for 10 mins. Then, grind these roasted ingredients in a mixer into a fine powder and keep it aside. Your biryani masala powder is ready. Now take 4 cups water in a pan and keep it on a low flame. Add the ingredients mentioned under rice section in this recipe into this water and let it come to a boil. When the water boils, drain the soaked rice and add it to the pan. Stir it well and cover the pan with a lid for the rice to cook. This will take around 10-12 mins. Keep monitoring the boiling of the rice from time to time. As the rice is cooking, simultaneously start making the gravy on another flame. Take another pan and add oil in it. 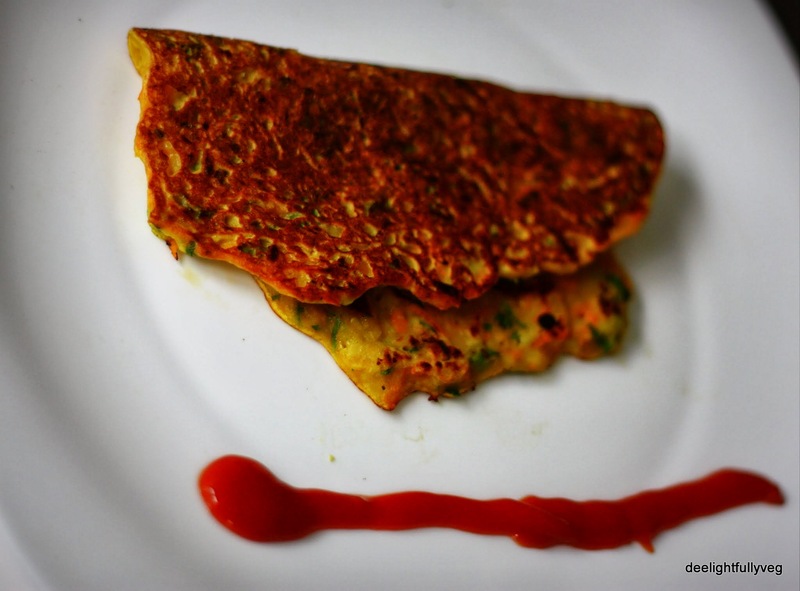 Once the oil heats up, add the bay leaf, ginger-garlic paste, green chillies and tomato puree. Saute it for around 2 mins till the raw flavour of tomatoes goes away. Add green bell peppers and peas and let them partially cook for 6-7 mins. Cover with a lid at this stage. Now remove the pan from the flame and add the yogurt to this partially cooked gravy and mix well. Place this pan back on the stove and add the remaining ingredients which are turmeric, biryani masala powder (which you have already made in mixer) and salt. Mix the spices well and let this cook for another 10 mins on low flame till the vegetables are fully cooked. If your gravy is turning thick, add a small amount of water. The biryani rice should have been done in the meantime. Switch of the rice flame and let it cool for 5 mins. Lightly grease a non-stick vessel with oil and start stacking the layers. Once the placement of layers is done, cook this on a low flame for 10 mins with a lid. Do not shake the vessel too much while placing this on the flame. Meanwhile, soak the saffron stands in warm milk for around 10 mins. Drizzle it on the topmost layer of rice. Roast the cashews and add them as garnish on the top. Do all the stages of cooking process on slow flame. Do not add yogurt in the gravy while on the flame. Remove it to avoid curdling. Avoid using extremely sour yogurt. Experimenting with new ingredients gives me a high. Lotus seeds are an ingredient I hadn’t heard about – let alone tasted. I came across them in an article by Rujuta Diwekar, the famous Indian nutritionist who suggested using it as a healthy snack. It can be consumed (like popcorn) by dry roasting. It is also largely consumed during fasting. I wanted to make a curry that could be had with rotis. Then began the daunting process of finding it in Singapore. Mustafa is the place where most of the Indian cooking specific ingredients can be found – but the shopping complex is huge. If you do not know the ingredient shelves properly, you may never find it. It took me two visits in two months just to figure that out since I don’t frequent the area often. After this, what remained to be done was just the cooking part. I jumped on to the task and needless to say, I was deelighted with the way the dish turned out. 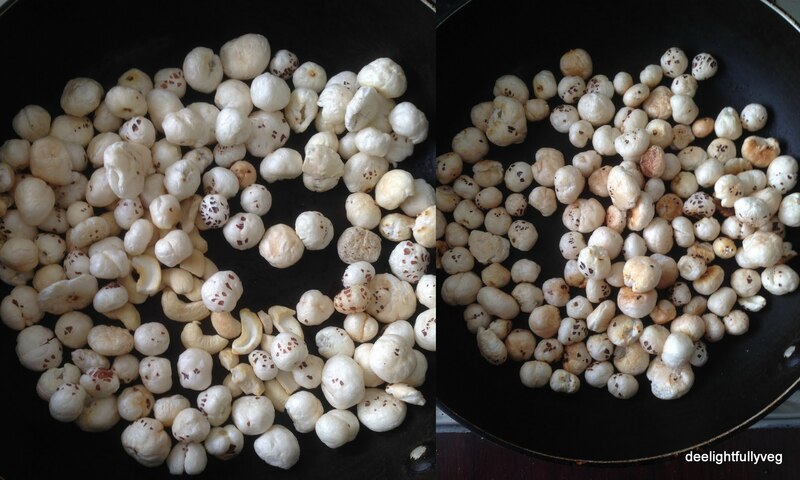 Roast the lotus seeds and cashews in a pan (left half of pic). Roast on a low flame till they are light brown in colour (right half of pic). Switch off the flame and let them cool for 15 mins. Meanwhile, grind the ingredients mentioned in the grinding section into a smooth paste. Next, add the bell peppers and salt along with around 2 cups of water. Cover the pan and let it cook for around 5 mins. 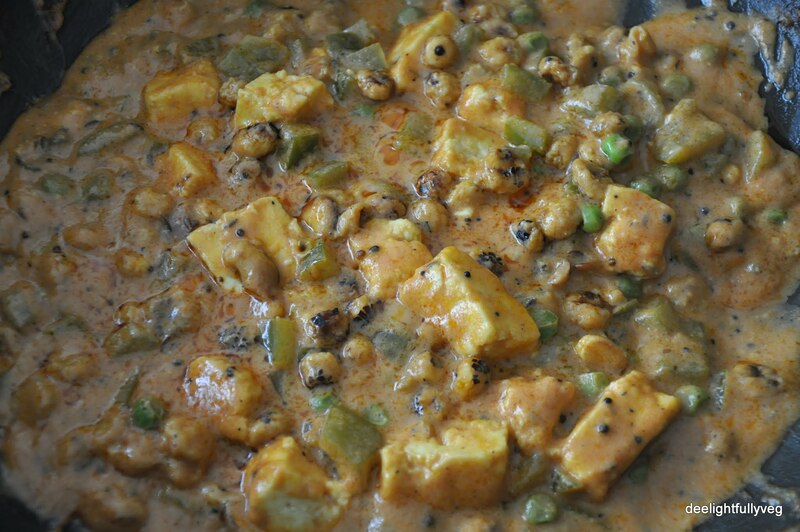 Add the lotus seeds, paneer and peas into the rich gravy and let them cook for another 5-7 mins. At this stage the colour of the gravy will look as shown in the pic above. Cook the paneer well and let it fully marinate. The colour of the gravy will also slowly change and become a nice yellow colour. Garnish with coriander and serve hot with rotis. The final dish will be mouthwatering for sure! If you have a high flame, roast the cashews and lotus seeds separately as the cashews roast, and therefore burn faster. Do not increase the quantity of cashews as the gravy will become too thick. Mixed vegetable curries involve quite a bit of prep work depending on the number of vegetables being used in the dish. I wanted a curry with a simple vegetable pairing that would give both volume and texture to the dish and also be quick to make. 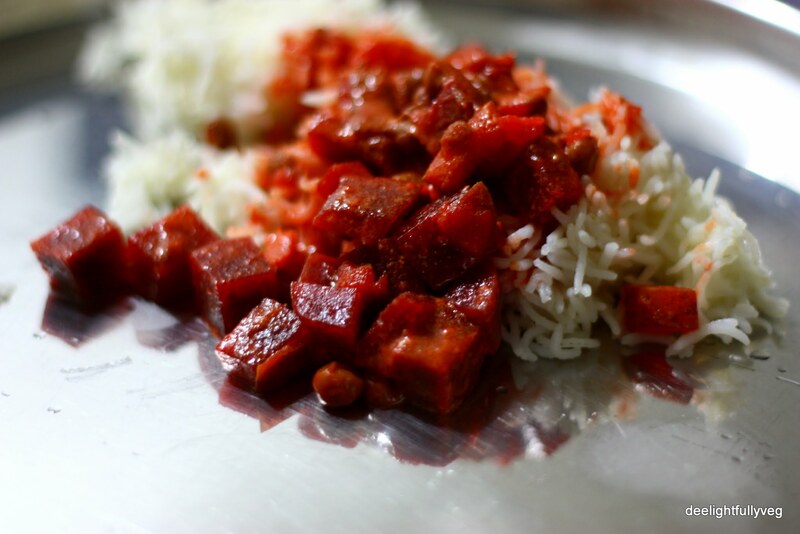 I spotted some lovely beetroot and decided to toss in some peas and make a delicious dish to be served with rice. Apart from the ease in cooking, beets are a rich source of nutrients and are also known for their anti-carcinogenic properties. Since I was serving it with rice, I needed it to have nice broth for which coconut milk was just the right ingredient. The dish turned out to be a perfect combination of veggies, broth and taste. Take oil in a pan and add the cumin seeds. Once they splutter, add the ginger garlic paste and stir for 30 secs on a low flame. Add the chopped beets at this stage. Sauté them with some salt and turmeric powder, then cover the pan with a lid and cook them for around 8 mins. Sprinkle a bit of water on the beets to enable faster cooking. Add peas and cook the vegetables till they are tender. Add all the chili and coconut milk and simmer on a low flame till you get the desired consistency. Garish with coriander leaves and curry leaves and serve with rice. Cook on a low flame and do not allow the vegetables to overcook.